2. Place the butternut squash and thyme in a roasting tin and drizzle with 1 tbsp of oil and season. Roast for 15 - 20 minutes until cooked. Remove from oven and set aside until later. Place the spelt in a sieve and rinse until the water runs clear. 3. Meanwhile, heat the remaining oil in a large pan along with a little butter. Gently fry the onion and garlic over a medium heat for 5 minutes until softened. Add the rinsed spelt to the pan and stir to coat in the oil. 4. Pour half the stock into the pan and gently simmer for approximately 10 minutes until the stock has been absorbed. Add the remaining stock and allow to cook for another 10 - 15 minutes, again until the stock has been absorbed. 5. In the last 5 minutes of cooking, add the cooked butternut squash to the risotto to warm through. Melt a little butter in a separate frying pan and roughly chop the mushrooms. Fry over a high heat for 3 - 5 minutes until the mushrooms are golden but still holding form. 6. 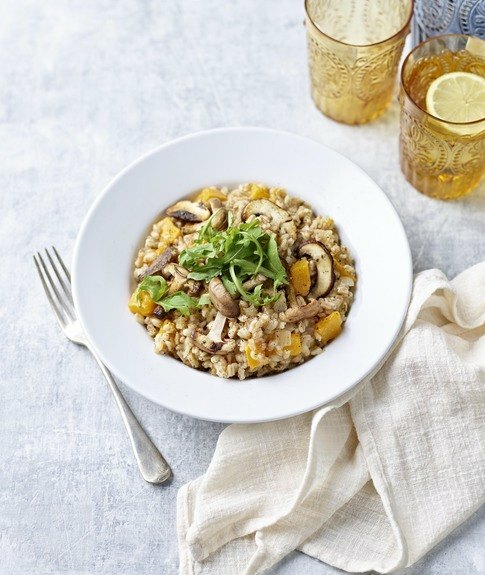 To serve, spoon the risotto into bowls, and top with the fried mushrooms. Sprinkle over a handful of rocket leaves and finish with a generous grating of parmesan, salt and cracked black pepper.